Guest contributor Patty Cantrell is principal of Regional Food Solutions, a Missouri-based consulting firm that provides organizations and businesses with expert project development, writing, research, and facilitation — with a focus on the community economic development power that comes from supporting family-scale, place-based farms in their work to produce food that is healthy for people and the planet. She writes here about how Louisville, Kentucky, is placing a heavy emphasis on local food in its economic development initiatives. Her article discusses how the potential for this urban-rural connection to promote jobs and development, and brings to light the West Louisville FoodPort, a 24-acre, $65 million project to help local and regional food businesses grow, in which FarmedHere — an innovative indoor vertical farming operation — will open its first facility beyond the original in metropolitan Chicago. This piece also makes clear the meaning of the term “value chain coordinator,” which will be heard a lot as supply chains develop to increase the amounts of local and regional food available in markets around the nation. Cantrell previously wrote an article, which drew much reader attention, about how businesses that emphasize locally made products are reviving the long-lagging economy in Corbin, Kentucky. Her column was originally published on the blog of Wallace Center at Winrock International, a nonprofit organization that supports entrepreneurs and communities as they build a new, 21st century food system that is healthier for people, the environment, and the economy. To learn more about the Wallace Center, click here. 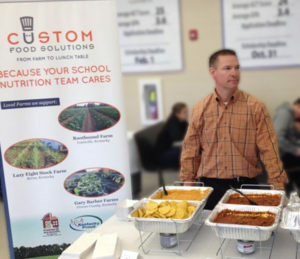 Mike Higgins had just become president of a national food manufacturing company based in Louisville, Kentucky, when he met Sarah Fritschner from the city’s economic development department. Jim Barham is an economist with the U.S. Department of Agriculture. He calls this business-to-business relationship building the “soft infrastructure” that makes other “hard infrastructure” like trucks and packing lines work. USDA just launched a new program to support and partner with regional food relationship brokers such as Fritschner, known as “value chain coordinators,” in 10 metropolitan regions. Louisville is one of the partners and the only municipality in the group. Value chains are mutual-aid affairs. They are supply chains built by businesses that need each other to satisfy demand. In the case of local and regional food, they’re trying to deliver on higher-purpose values that consumers and communities are bringing to market. Piazza reached the $1 million mark last year in local food; half produce and half meats and value-added products such as cheeses. “The political environment that our mayor established has been key across the board,” Heine said. Zawacki explained the economic development thinking behind business clusters. A 100+-member community council was part of planning from the start of the FoodPort, also known as a food innovation district. John Edwards is co-owner of the new Trackside Butcher Shoppe meat processing facility in Henry County, northeast of Louisville. Fritschner hooked him up with mentors and others who have been key in getting Trackside off to a successful start. This entry was posted in Family Farms, Farm businesses, Food Entrepreneurs, Food Hubs, Good Food and economic development, Good Food business development, Local Food, Regional food systems, Supply chain, Sustainable food business investment, Value Chain Coordination and tagged Custom Food Solutions, FarmedHere, food innovation district, Just One Organics, Kentucky, local and regional food, local food, Local food and economic development, local food and jobs, Louisville, Louisville Forward, Piazza Produce, Regional Food Solutions, Seed Capital Kentucky, The Weekly Juicery, Trackside Butcher Shoppe, U.S. Department of Agriculture, value chain coordinators, West Louisville FoodPort. Bookmark the permalink.